Our Deeply Clean UltraMicrofibre cloths are made from a blend of synthetic fibres which are less that 1/100th the diameter of a human hair. The fabric is generally made from a combination of Polyester and Polyamide and is used to make a range of cleaning cloths to suit a vast selection of uses from household cleaning to industrial and commercial applications. In our highest-quality fabrics for many cleaning applications, the fibre is split during the manufacturing process to produce spaces in each fibre. It’s this split fibre, and the size of the individual filaments working in conjunction with the spaces between them that does all the hard work. These fibres pick up and hold surface debris and dirt particles as well as absorbing fluid. 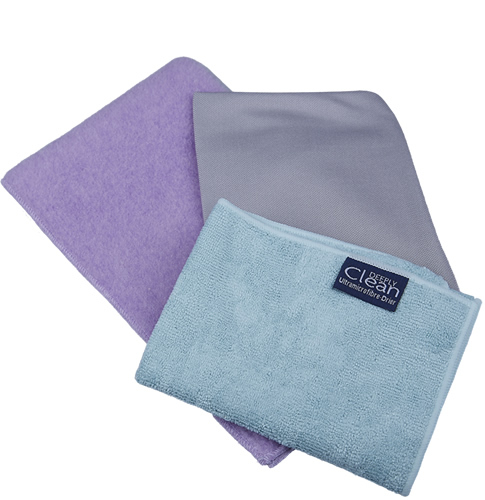 Unlike cotton, microfibre leaves no lint, the exception being some micro suede blends, where the surface is mechanically processed to produce a soft plush feel. For microfibre to be most effective as a cleaning product, especially for water soluble soils and waxes, it should be a split microfibre as is the case with Deeply Clean. In addition to the open spaces in the fibres created during the splitting process, microfibre is an effective cleaning tool because the fibres are positively charged. Dirt and dust are negatively charged so they are attracted to microfibre like a magnet. The microfibre holds on to the dust and dirt until it is released in the laundering process or when it is rinsed out.